April, 2013, I finished up my Census Tract walk, heading down to the last tract I had left in Manhattan Beach, Brooklyn. Tim Stelloh, a great journalist and fun guy to walk about town with, write a short piece about it here. In the future, if you need to get your walking-around-town fix, I suggest you check out Matt Green's imjustwalkin.com - he's walking every street in the five boroughs. In conjunction with finishing both the walk and my book, I'm retiring this blog as well, although I might still update the travel blog from time to time. You can still follow along with whatever I happen to be doing in life on the Twitter or the Instagram if you like though. 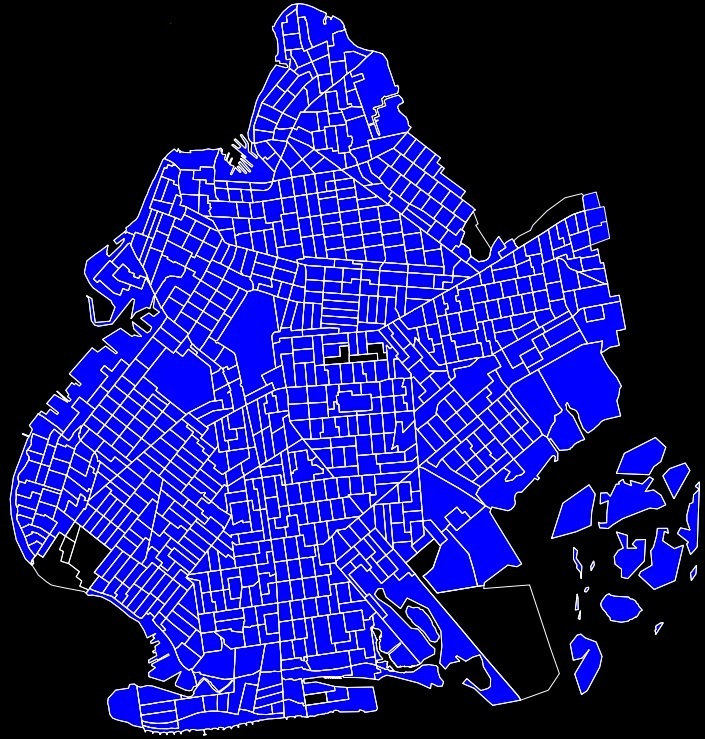 A final note - to be fair, Big Pun should be singing 99.95% - Because out of the 2217 census tracts, I actually still haven't gotten to one of them - Bronx Census Tract number 1. But that's the only one I've actively been trying to miss. Riker's Island. Following up on the diversity index post from last week, more on the WNYC story about tract 754 in Midwood being the "least diverse neighborhood in the city." One problem with this contention is that a single census tract is almost never a "neighborhood." Now, there are some cases where you can make the argument that a neighborhood falls within a single census tract: Co-op City, Broad Channel, Breezy Point, and City Island come to mind, for instance. But tract 754 is definitely not a "neighborhood." In fact, the article references several things outside the tract to try and demonstrate the character of the neighborhood, such as the synagogues within walking distance, and the kosher bagel shops and travel agencies advertising trips to Israel on the commercial strip about 5 blocks away. So let's analyze the larger neighborhood picture to see if it's really the "least diverse neighborhood in the city." In red, above, is Brooklyn Census Tract 754, which has a diversity index of 1. In blue is tract 754, plus every tract that borders it (748, 750, 752, 756, 758, 760). This isn't meant to be the borders of "Midwood," it's just meant to give an example of a reasonable geographical area that could be called a "neighborhood" which centers on tract 754. This lets us see how diverse tract 754's "neighborhood" is. Running the diversity index on the larger area, it ends up at 27*. And if you include an additional two tracts to the west, which encompass the commercial strip WNYC article describes in the article, it ends up even higher at 32. Now, 27 is still not very high, especially for New York City, whose diversity index as a whole is 78.5, or for Brooklyn, which scores a 74, or even for New York State, which scores a 62**. But it is still far from extreme. For instance, it's a score as high or higher than 8 states (New Hampshire, Vermont, Montana, North Dakota, Iowa, West Virginia, Kentucky, and tied with Wyoming). It's also a higher score than several other places in New York that are considered "neighborhoods," like Howard Beach (23), Gerritsen Beach (21), Broad Channel (19), Manhattan Beach (10), and Breezy Point (7). For those curious, these are all predominantly white neighborhoods. There are also predominantly African-American neighborhoods, all in Central Brooklyn and Southeast Queens, that I can assume would also score lower than the "Midwood" area I aggregated (there are no predominantly Hispanic or Asian neighborhoods that even come close to Midwood's score, although there is one tract in Chinatown that scores a 24). 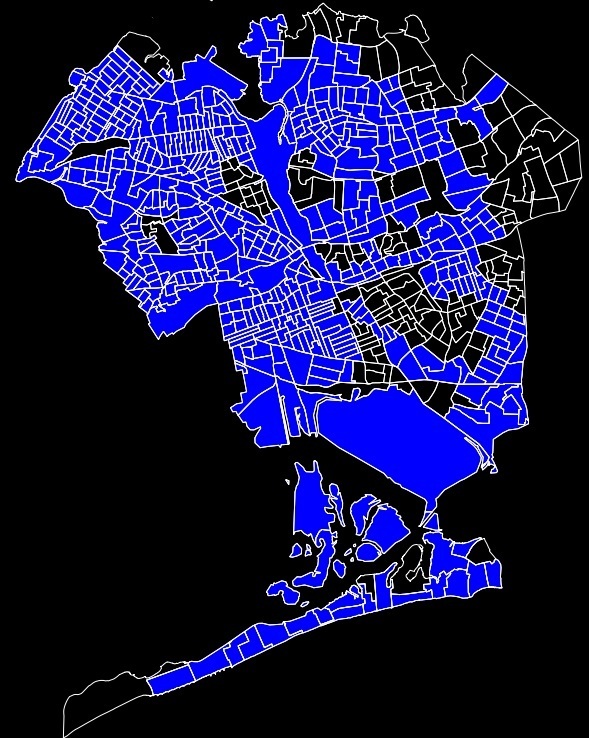 But what you would call a "neighborhood" in those areas is made up of many more census tracts than the neighborhoods referenced above, which are made up of 3 tracts at most and are generally just one or two, and more than I can do a quick and accurate back-of-the-envelope calculation with. For instance, a reasonable definition of "St. Albans," would be about 15 separate tracts, and for "East Flatbush" would be about 30. For what it's worth, I'm almost certain St. Albans, Cambria Heights, Laurelton, and East Flatbush would all score lower than 27. There are also some other predominantly white neighborhoods made up of several census tracts, like Borough Park, which would score lower than 27. 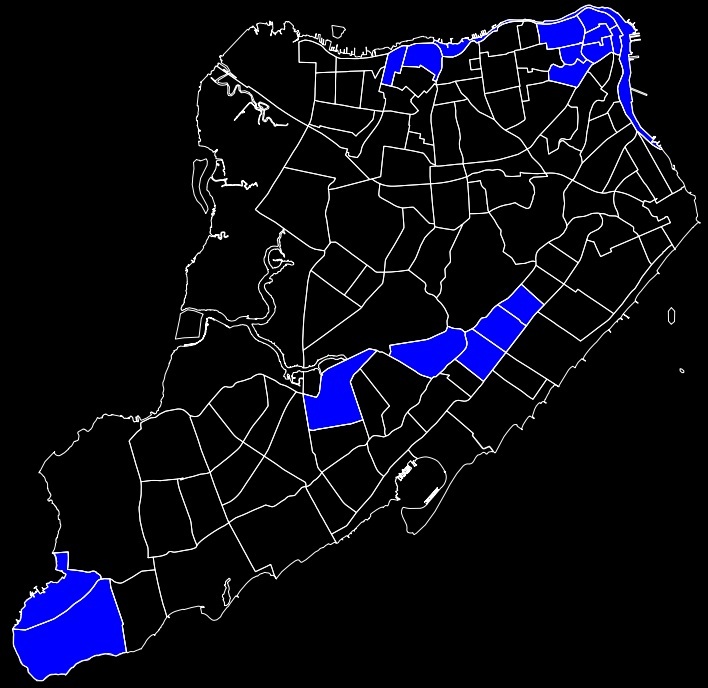 And in addition, there are several areas - both predominantly white and predominantly African-American - of at least seven census tracts (the same amount as the "Midwood," area I aggregated), but which only make up part of a neighborhood, where this is true as well. The real point to this exercise is to demonstrate that much of the conversation around the neighbohoods of New York City is heavily dependent on the details of the geography you use. There is no real objectively "correct" geography when it comes to "neighborhoods" in New York, but it's important not to be loose with the term either. The WNYC article reads as claiming that Midwood is the least diverse neighborhood in New York (which is demonstrably untrue), and you have to really examine the article with much closer attention than I believe it is fair to expect a lay reader to do in order to realize that this might not be the case. *I should note that I calculate the diversity index slightly differently from the most commonly used calculation, which is USA Today's. Specifically, I include "other race" in the base calculation. In the neighborhoods I analyzed, this doesn't have an effect of more than a point or two difference at most. ** I should also note comparing the diversity index across different sized geographies is not really a good comparison. Especially at very small geographies, it breaks down. For instance, the vast majority of houses in America have a diversity index of 0, as everyone in the household is usually of the same race. An area's diversity index should really be compared across other similar sized geographies, in this case about 18,000 people. WNYC has a really interesting interactive map which measures the diversity of each New York City Census Tract. It's worth noting that the definition of "diversity" is based on the Diversity Index. This is the probability that two people chosen at random will be of a different race and ethnicity (by "ethnicity" I mean the census definition, which is either Hispanic or non-Hispanic). It's a good and simple measurement for racial diversity, and mathematically allows for diversity to increase based on two factors - both a higher percentage of people of minority groups, as well as the amount of minority groups themselves. For instance, a tract that's 75% Black and 25% Asian would have a diversity index of 38.5, while one that's 50% Black and 50% Asian would have a diversity index of 50. However, one that is 50% Black, 25% Asian, and 25% Pacific Islander would have a diversity index of 62.5. But this index is one that is not really designed for the type of diversity we're used to here in New York, where we think of language, religion, ethnicity (in the non-census sense of the word), being foreign-born, and several other factors as contributing to "diversity," as well as race. For instance, take the tract in Midwood (Brooklyn Tract 754) a mainly Orthodox Jewish neighborhood that they report on as "the most homogeneous in NYC." While the tract is 100% white and only .3% Hispanic, if you dig a little deeper the numbers tell a different story. According to the 5-year ACS data, 7.7% of the residents are of Arabic ancestry (who are classified as "white" by the census), 15% of residents are foreign-born, and almost 20% of residents speak a language other than English at home*. Not huge indicators of diversity by NYC standards, but a ways away from deserving the label "homogeneous." As for the Jewishness of the neighborhood, this is tougher to quantify, but there are clues in the Ancestry category. The census does not count religion, and will not enumerate any answer in the Ancestry category that they consider a religious answer, instead putting them in the "other group" category. This includes "Jewish," as well an any and all derivatives (even ones considered more ethnic than religious, like "Askenazic"). A little over half of the First Ancestry category is enumerated as "other groups." Unfortunately, this doesn't really tell us a whole lot, as a little over half of New York City overall falls into the "other group" category and New York City is only estimated at about 10% Jewish. However, to complicate things even more, a large percentage (probably close to half) of these are answers are various Hispanic ancestries, which the census tabulates as Ethnicity and not Ancestry. And since our tract as a whole is only .3% Hispanic, we can pretty safely assume a good amount of the "other group" is Jewish. In addition, about a quarter of the responses are various Eastern European ancestries that are likely to have been put down by Jewish respondents. Taking this data, and factoring in some observation from a quick stroll through the neighborhood, I think it's safe to assume the neighborhood is at least half Jewish. But, there's one more clue. About 20% of the First Ancestry answers are ones very unlikely to be put down by Jewish respondents. These are English, Irish, American, and Lebanese. (There is also Syrian and Iranian ancestry reported, but Southern Brooklyn has communities of Syrian and Iranian Jews). This lets us peg the Census Tract as one that's at most 80% Jewish, giving us a (very rough and unscientific) estimate of about 50-80% Jewish overall. There's really no way of knowing beyond this rough and unscientific guess how Jewish the tract actually is, (much less how Orthodox Jewish), but I think we know enough to say "homogenously," would not be a fair adjective to use.In fact, rather than portraying the eight blocks of Midwood as some kind of insular shtetl, a far better angle for the story would have been "even at its most homogenous, NYC is amazingly diverse." *It should be noted that the margins of error for these questions on the Census Tract level are enormous, due to the replacement of the Census Long Form with the American Community Survey. But you work with the datasets you have. Short writeup (and photos courtesy of noclip.eu) about climbing an absolutely majestic bridge in Scotland over on the travel blog. Hart Island is not its own census tract - instead being included in Bronx Tract 516 along with City Island. This is probably why I never felt the kind of sense of purpose in getting there that I've felt with some islands with no land access - like the Brother Islands or some Jamaica Bay Islands - that make up the entirety of their census tracts. If I had felt that, I'm sure I would have done what others have done - take a boat or canoe out very early Sunday morning, when the island is inactive. For those who don't know, Hart Island is the city's Potters Field, and the largest taxpayer-funded cemetery in the world. Inmates from Riker's Island do the work, and as a result the island is fairly well patrolled when it's active. Instead I went a different way, on a bimonthly memorial trip with Picture the Homeless, an advocacy group. The visit was brief, and very moving. A memorial pagoda has been constructed a short ways away from where the ferry docks on the island, and the trip consisted of a short walk there, a remembrance of the people buried on the island among the group, and a slightly longer walk back. Altogether there was an amazing sense of peace to the island, a sense I would have been bereft of if I had chosen to go a more clandestine route. There is no reason why there cannot be more public access to the island. In the 1990s extensive tours of the island were offered. I chatted a bit with two corrections officers in charge of the island about why the visits were now so infrequent and restricted, with no pictures or journalists allowed. Now, these are the guys who run the jails. As such I suspected "security" - probably having to do with the fact that prisoners work on the island burying the dead - to simply be the knee-jerk response. 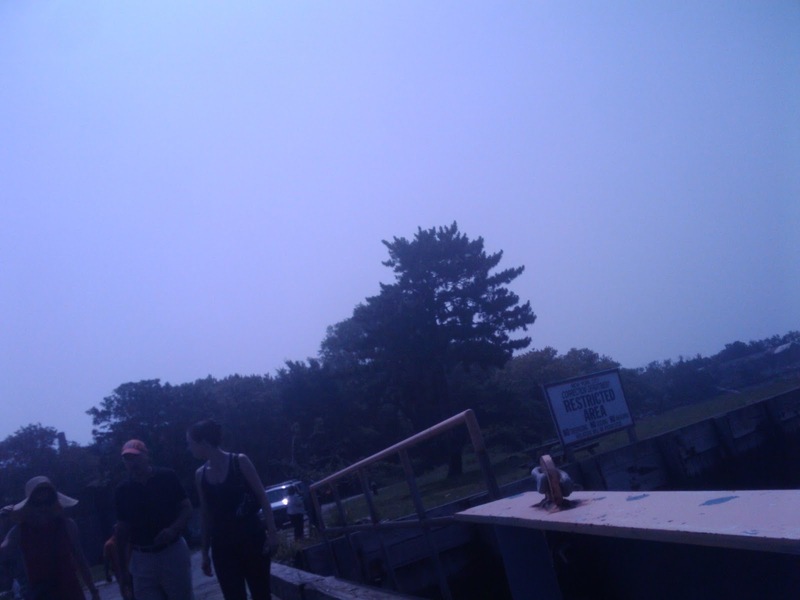 But instead I got something different - that the island was for the families of the deceased, that they didn't want to offend anyone by allowing just anyone access to the place. "That's not what this place is about" was one response I got when I asked why people couldn't visit. I accepted that they personally believed this, although on an institutional level it made no sense. Discounting the fact that families have to go through an extremely onerous process to even visit, no other city has this issue - we are the only municipality without open access to our public cemetery. After all, cemeteries are by and large public spaces. I have never in my life heard anyone complain that a stranger was walking through a cemetery where their loved one happened to be buried. And it shouldn't matter anyway - what the officers didn't understand was that this shouldn't be their decision to make. Often time civil servants feel a sense of ownership of the public works they're sent to steward, forgetting the "public" part of the "public works." Luckily, there's been a little bit of interest in more open access, with the City Council looking at switching the jurisdiction to the Parks Department from the Department of Corrections, and otherwise trying to make the island more accessible. It would be a wonderful public benefit to combine the best of the two ways people visit now: the freedom of going without supervision, along with the calm of going legitimately. In their testimony before City Council the Corrections Department was reduced to citing "lack of bathrooms and water fountains" as a reason visitation isn't allowed. That this island isn't available for visitation yet is simply a testimony to the culture of providing public accessibility here in New York - that it's simply not worth the hassle. In a normal paradigm, public ownership, demand, and the lack of any rational reason to deny access would lead to an open area. But in New York we're always struggling against the "just easier to keep it closed" mentality.